Definition at line 45 of file llfloaterpostcard.h. Definition at line 77 of file llfloaterpostcard.cpp. Definition at line 105 of file llfloaterpostcard.cpp. References mJPEGImage, NULL, LLLinkedList< DATA_TYPE >::removeData(), and sInstances. Definition at line 170 of file llfloaterpostcard.cpp. 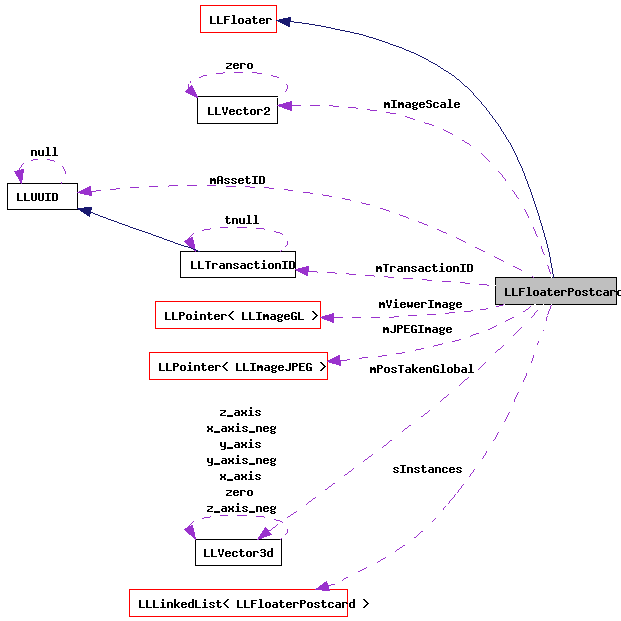 References LLFloater::draw(), f, LLView::getVisible(), gl_draw_scaled_image(), gl_rect_2d(), glPopMatrix, mImageScale, mJPEGImage, LLFloater::mMinimized, LLView::mRect, LLVector2::mV, mViewerImage, LLPointer< Type >::notNull(), S32, VX, VY, and LLColor4::white. Definition at line 88 of file llfloaterpostcard.cpp. References _PREHASH_AgentData, _PREHASH_AgentID, _PREHASH_SessionID, _PREHASH_UserInfoRequest, LLLinkedList< DATA_TYPE >::addData(), LLMessageSystem::addUUIDFast(), gAgent, LLAgent::getID(), LLAgent::getSessionID(), gMessageSystem, LLUUID::isNull(), LLMessageSystem::newMessageFast(), LLMessageSystem::nextBlockFast(), LLAgent::sendReliableMessage(), and sInstances. Definition at line 365 of file llfloaterpostcard.cpp. Definition at line 223 of file llfloaterpostcard.cpp. Definition at line 291 of file llfloaterpostcard.cpp. Definition at line 251 of file llfloaterpostcard.cpp. References LLViewerWindow::alertXml(), gViewerWindow, and missingSubjMsgAlertCallback(). Definition at line 351 of file llfloaterpostcard.cpp. References LLUICtrlFactory::getTextEditorByName(), LLUICtrl::hasFocus(), LLStringBase< char >::null, and LLTextEditor::setText(). Definition at line 111 of file llfloaterpostcard.cpp. References LLAgent::buildFullname(), LLPanel::childDisable(), LLPanel::childHide(), LLPanel::childSetAction(), LLPanel::childSetFocus(), LLPanel::childSetValue(), gAgent, LLUICtrlFactory::getTextEditorByName(), LLAgent::isTeen(), onClickCancel(), onClickPublishHelp(), onClickSend(), onMsgFormFocusRecieved(), LLUICtrl::setCallbackUserData(), LLUICtrl::setFocusChangedCallback(), LLTextEditor::setWordWrap(), and TRUE. Definition at line 391 of file llfloaterpostcard.cpp. References LLSD::asBoolean(), LLSD::asString(), LLAssetType::AT_IMAGE_JPEG, LLPanel::childGetValue(), LLSD::emptyMap(), FALSE, gAgent, gAssetStorage, LLUUID::generate(), LLViewerRegion::getCapability(), LLFloater::getDependee(), LLAgent::getRegion(), LLAgent::getSecureSessionID(), LLVector3d::getValue(), gVFS, llendl, llinfos, LLTransactionID::makeAssetID(), mAssetID, mJPEGImage, LLUploadDialog::modalUploadDialog(), mPosTakenGlobal, mTransactionID, LLHTTPClient::post(), LLFloater::removeDependentFloater(), LLFloater::setVisible(), LLAssetStorage::storeAssetData(), uploadCallback(), and LLVFile::writeFile(). Definition at line 153 of file llfloaterpostcard.cpp. 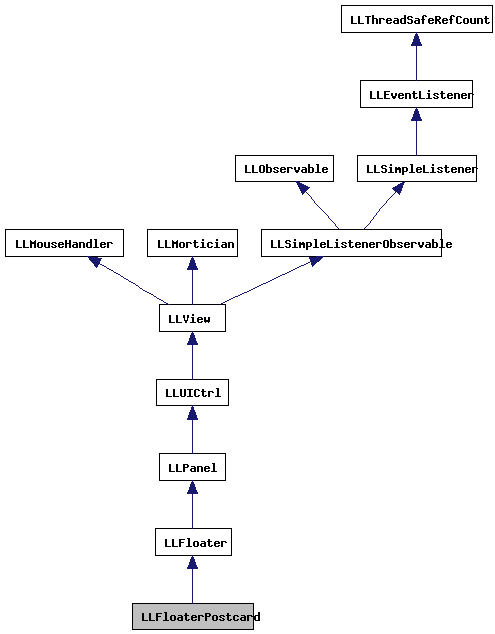 References LLUICtrlFactory::buildFloater(), LLRectBase< Type >::getHeight(), LLFloaterView::getNewFloaterPosition(), LLView::getRect(), gFloaterView, gUICtrlFactory, left, LLFloaterPostcard(), LLFloater::open(), S32, LLView::setOrigin(), and top. Definition at line 335 of file llfloaterpostcard.cpp. References LLSD::asString(), LLPanel::childGetValue(), LLPanel::childSetValue(), LLLinkedList< DATA_TYPE >::getNextData(), LLLinkedList< DATA_TYPE >::resetList(), and sInstances. Definition at line 297 of file llfloaterpostcard.cpp. References LLMessageSystem::addBOOL(), LLMessageSystem::addString(), LLMessageSystem::addUUID(), LLMessageSystem::addVector3d(), LLViewerWindow::alertXml(), gAgent, LLAssetStorage::getErrorString(), LLAgent::getID(), LLAgent::getSessionID(), gMessageSystem, gViewerWindow, LLUploadDialog::modalUploadFinished(), LLMessageSystem::newMessage(), LLMessageSystem::nextBlock(), and LLAgent::sendReliableMessage(). Definition at line 78 of file llfloaterpostcard.h. Definition at line 81 of file llfloaterpostcard.h. Definition at line 79 of file llfloaterpostcard.h. Definition at line 75 of file llfloaterpostcard.h. Referenced by draw(), sendPostcard(), and ~LLFloaterPostcard(). Definition at line 80 of file llfloaterpostcard.h. Definition at line 77 of file llfloaterpostcard.h. Definition at line 76 of file llfloaterpostcard.h. Definition at line 83 of file llfloaterpostcard.h. Referenced by init(), updateUserInfo(), and ~LLFloaterPostcard().